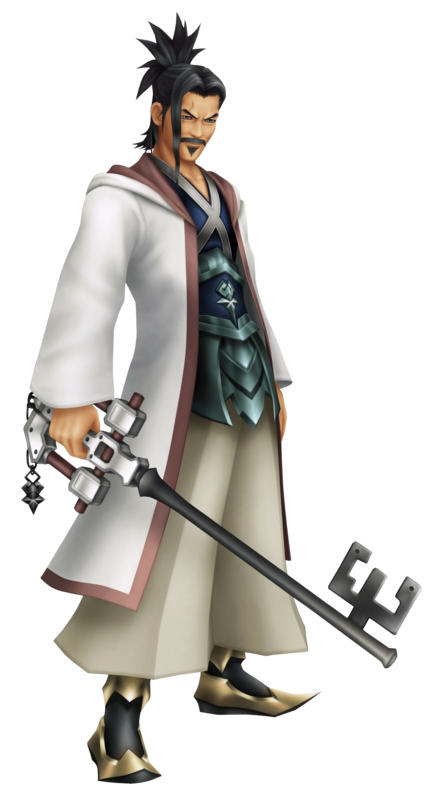 A stern Keyblade Master whose goal is to preserve peace across the worlds through the eradication of darkness, he is the teacher to Terra, Aqua and Ven. Years before the earliest events of Birth by Sleep began to unfold, he and Master Xehanort were companion Keyblade wielders, and it was from Xehanort that Eraqus gained the jagged scars on his face. When Master Xehanort visited the Land of Departure with Ven in tow, Eraqus agrees to oversee the training of the boy. When Terra fails the Mark of Mastery exam, Eraqus tells Terra it was the darkness in his heart that rendered him inadequate, particularly his inability to control it. Even Master Eraqus did not know the presence of darkness in the exam was Xehanort's doing. Soon after the exam Eraqus sends Terra on his missions after finding Master Xehanort missing and hearing about the escalation of the Unversed threat from Master Yen Sid. After Terra's departure, Eraqus and Aqua witness Ven leaving too, and so the experienced Keyblade Master tasks the newer one with the dual mission of bringing Ven back and observing Terra's actions. Near to the very end of his own adventure, Ven discovers the entire truth of his past and goes to Master Eraqus in an attempt to establish the facts of it. Eraqus is pleased that Ven has returned - especially on his own - but the boy, confused and angered, is totally disinterested in Eraqus' warm welcome. When questions about the χ-blade, Eraqus recalls a discussion he had with Master Xehanort about the Keyblade war and how it may have been fought over that very weapon. He also explains that a fundamental difference in the two masters' ideals, leading to a battle between the two in which Master Xehanort quickly proved the more powerful of the two, and gave Eraqus his scars in this encounter. Regretfully acknowledging that Ven's continued existence made the forging of the χ-blade a very real possibility, Eraqus attacks Ven, at the same time as Terra is on his way to the Land of Departure, only understanding a part of the whole picture and having been tricked into thinking that Ven's safety would only be wholly ascertained with the elimination of his former master. Eraqus prepares to fight both of them, but Terra summons a Corridor of Darkness to the Destiny Islands and throws Ven through it before engaging Eraqus in single combat. Terra's victory leaves Eraqus wounded, but as they both come to regret their actions and realise the error of their ways, Master Xehanort arrives and strikes down Eraqus. After Terra's body has been possessed by Master Xehanort - though the young Keyblade wielder still fights his control - the latter wonders how Terra is still able to resist to strongly, soon realising that the cause of this is Eraqus lingering presence in Terra's heart.